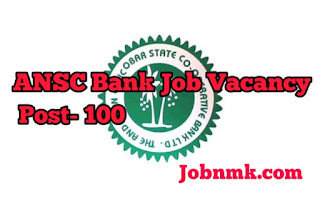 ANSC Bank Job Vacancies Clerk and Other Posts. Andaman Nicobar State Cooperative Bank Has recently Invited Online Application Form for the Post of Clerk, Junior Auditor and Other Posts in ANSC Bank of Port Blair, Andaman and Nicobar Islands a Union Territory. Those Candidates are interested they Can Read the Full Notification Before they Apply Online application form. eligibility-:Candidate should have passed 10th/12th/ graduate, B.Com, Diploma, BCA, B.Sc. from a recognized University as per post qualification . Read the complete notification for more details about qualification. Andaman and Nicobar Islands of India. ₹18000 – 63200/- Per month. The Selection of candiate will be depend on the basis of Written Exam. The Eligible Candidates for the post can apply form by sending the application form to the Managing Director of, Andaman and Nicobar State Cooperative Bank Ltd., Head Office,98, Maulana Azad Road, Port Blair, Pin Code-: 744101 by 30 April 2019 upto 04:30 PM evening either in person or by post office. We hope you got proper information about ANSC Bank Job Vacancy.